Blood cancer has taken over 6-year-old Angel’s life. Once an enthusiastic and active child, Angel now doesn’t have any energy left in her. She is extremely weak, and her playful childhood is long behind her. On some days, she can’t even drink water without throwing up. 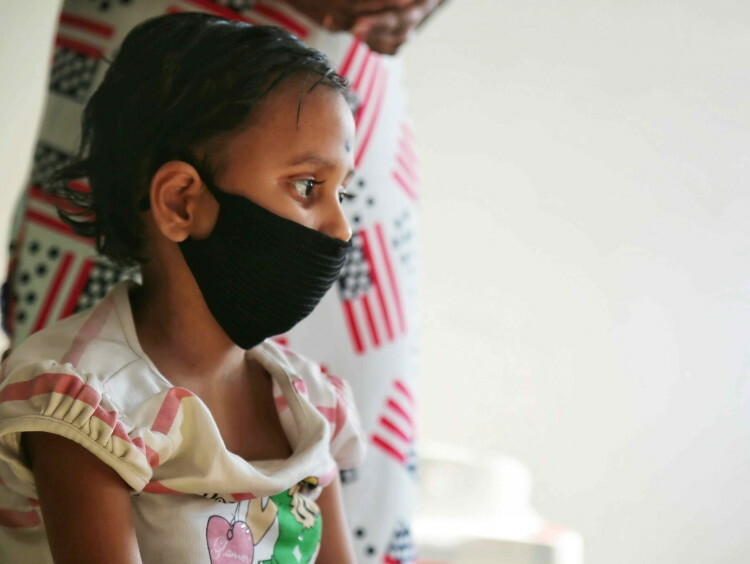 Her parents, Pintu and Pinku, have been living in fear about her future for 3 months now and will continue to do so if her treatment isn’t continued. Angel can survive cancer only with chemotherapy. Three months ago, Angel’s condition began rapidly deteriorating. 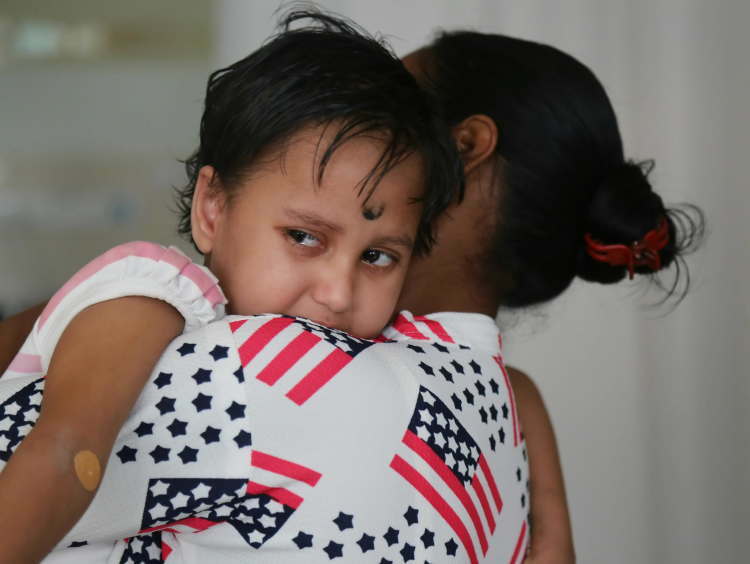 Pinku took her to several hospitals in their hometown in Guwahati, Assam, but to her disappointment, she got no answers and Angel got no respite from pain. She only got sicker. Angel was so weak, that she couldn’t even walk without falling. She barely ate, and when she did, she would throw up everything. Pintu and Pinku then took Angel all the way from Guwahati to Chennai to get her treated. They have finally found hope for their daughter. Now, Angel has had 3 cycles of chemotherapy, and still needs 4 more cycles. While she’s improving, they can’t breathe a sigh of relief yet. Without completing treatment, their Angel won’t make it. While there's hope for Angel's recovery, her parents have nothing left to save her. Pintu works as a salesman in a small furniture shop in Guwahati and earns just about enough to provide for his family of four. He’s struggling to keep up with Angel’s increasing medical expenses now. 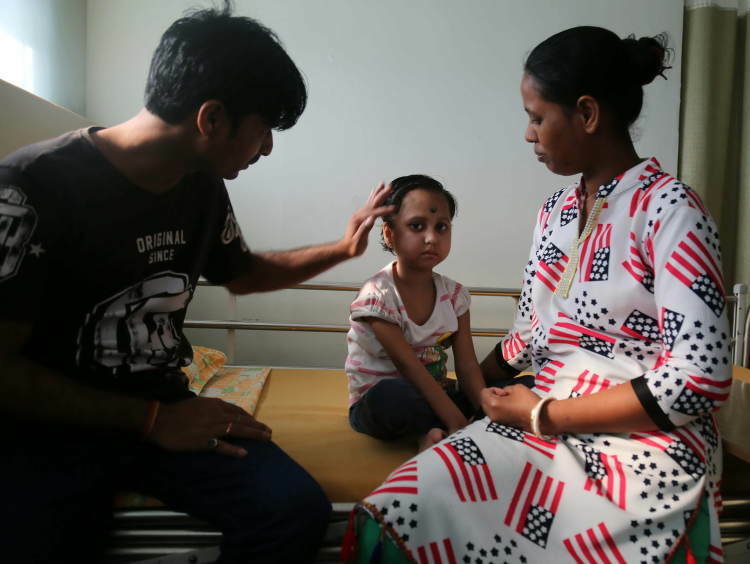 They have spent nearly 3 lakhs so far but now might be forced to face their biggest nightmare – stopping Angel’s treatment and losing her to cancer forever. Angel has made good progress in the one month of her treatment, but their empty pockets stand in the way of her cancer-free future. This is her only chance to beat cancer and she desperately needs your help. Angel needs urgent help to continue chemotherapy and have a fighting chance to beat cancer. 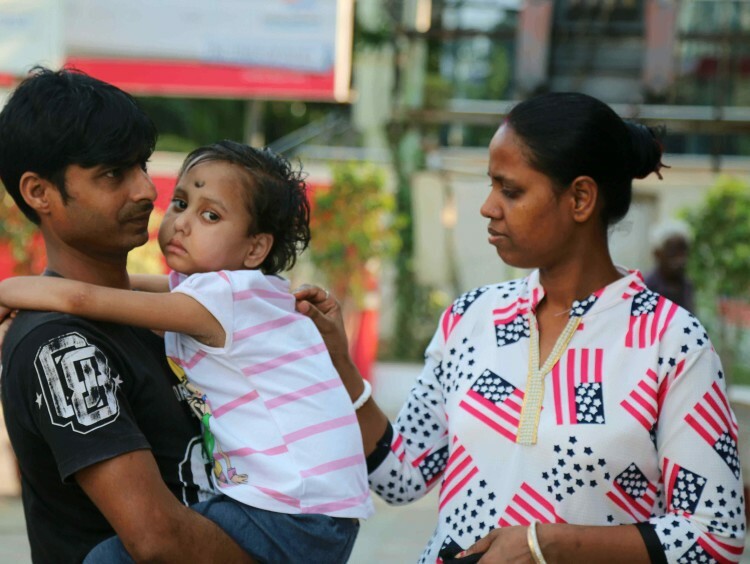 Pintu and Pinku have spent everything they had to ensure that she gets treated and can't afford the Rs 10 lakhs needed for her recovery. Angel needs your support to survive blood cancer. Your support will save Angel’s life. Angel has completed induction chemotherapy for acute lymphoblastic leukaemia and is now in remission. It gives us immense pleasure in informing you all that she will be ready to go home in about 4 weeks. 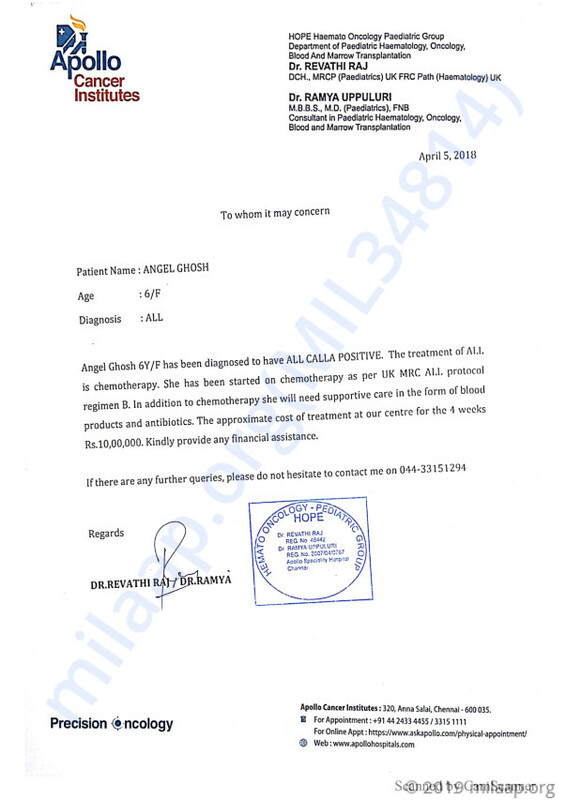 The treatment couldn't have been possible without you all and the timely support from Milaap. Thank you again. Please keep praying for her speedy recovery. Here is an update on Angel's health. Currently, Angel is doing fine and responding well to the treatment. So far she has undergone 5 cycles of chemotherapy. There were some side effects but she has overcome quite well. We have to visit the hospital for Lumbar Puncture (LP) on Thursday. She still needs to undergo 3 LPs and 2 chemo cycles. Doctors have told us that there are good chances of recovery as she is responding well to the treatment. Thank you for the love and support. Please keep praying for her health and speedy recovery.